This recipe is so easy but also incredibly tasty. You do need to plan a little in advance for the brining, but otherwise there’s nothing complicated about it. Place chicken in a bowl, pour enough water to cover the chicken. Add salt, stir well and leave in fridge overnight. Brining the chicken will ensure that it stays tender and moist even after frying. The next day, drain the brine and rinse chicken several times. Cut into small pieces. Add all ingredients except oil and corn flour. Stir well. Allow to marinade for about an hour. Heat oil for frying in a deep pot on medium heat. Once oil is hot, add corn flour to the chicken mix and stir well. Fry chicken pieces until cooked through. Drain on paper towels. In the hot oil, fry ginger matchsticks, then cashew nuts. Once golden brown remove from oil and layer on top of chicken. 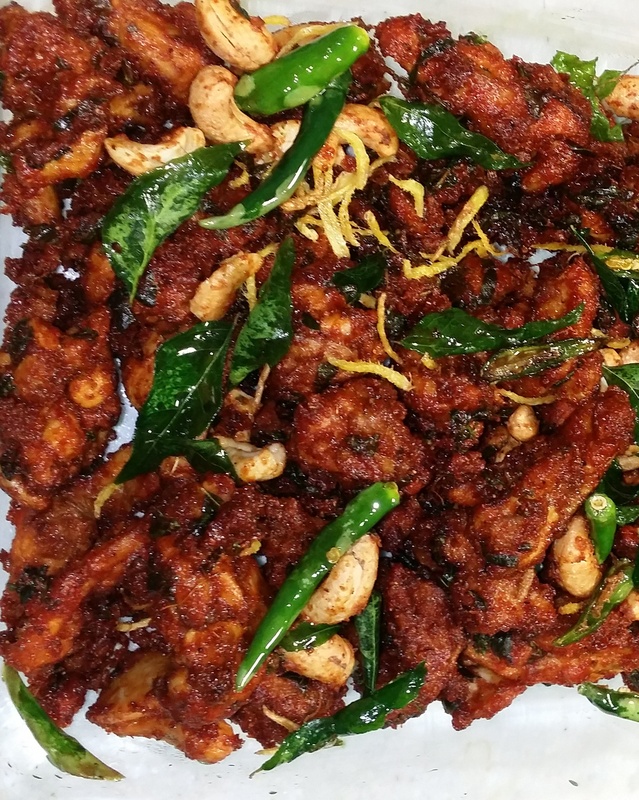 Also fry green chilies and curry leaves and add to fried chicken mix. Serve hot – Enjoy!